Treasurer’s report: moved seconded and approved. Modification to show $500 earmark for Jim Pace to attend National convention. Veteran’s Day Parade 25 May at noon. Motion, 2nd and approved to send $1,000.00 to Whatcom Memorial Day Parade to help sponsor the event. Chapter will attend dedication of the Vietnam Memorial at Greenacres. We need to get PR out on the event and our part. Next meeting will look for person to send out press releases to the paper(s), radio and any other media. State Council meeting at Legends Casino, 580 Fort Road, Toppenish. Phone 509-865-8800 for room rates if you plan to attend. Any problems call Odis 360-903-2699. VVA national convention in Spokane 15-21 July at Davenport Grand Hotel, 333 W. Spokane Falls Blvd. Phone 509-458-3333. The chapter will have 6 delegates attending, plus Jim Pace. VFW Auxiliary dinner 13 April at 18:00 (6:00 pm). The cost is $10.00 our bottle auction follows on the main floor at 19:00 (7:00pm). This is a money-maker for the chapter, so attend and bring your wallets. Car show update by Tom Modica. Sign-up sheets circulated for jobs to be filled. Doc reported that the flyers and posters are ready, but will not be circulated or posted this early. For trophy sponsorship see Tom M. Trophies to be pistons again – if we can find enough. Received from the Rickenbacker family $2,400 (again) and from Steve Desoer $883. Both gratefully acknowledged. Veterans pot Luck and horse ride on 6 April 17:00 – 20:00 at 3545 Birch Bay-Lynden Road, Custer. Gene G. brought up the fact that the DAV van needs replacement. He asked for $1000.00 from the chapter for signage on the van. Moved, seconded, approved. Randy T requested 8 volunteers for the Memorial Day Parade, to function as judges/gator drivers/vendor police etc. Contact Mac M. or randy. Historian Lana H. read a short biography of Ron Davenport, for whom the chapter is named. Interesting report. Jim Pace requested donation from the chapter to help offset the cost of a new flat screen TV for the Vets Center. Motion to contribute $500.00, seconded and approved. Jim also asked that the chapter be used as a “funnel” for contributions for the TV. The Vets Center cannot accept contributions. The chapter can help fund the Vets Center. After some discussion this was approved by membership. Randy E asked all to be considerate in their parking, it’s tight around here. The proceeds from the meal came to $227. 50/50 raffle proceeds were $41. Historian Lana Haddox gave a short talk about the length of our involvement in Vietnam and what it meant for those who served. Pledge of Allegiance recited by the membership. Invocation given by Chaplain Lonnie Rose, followed by a moment of silence for POW/MIA. Guests: Ann Brooks, Estrella Hurier, Benita Lipayon and Marcia Moon all of the VVAW(? ), Virginia (whose last name I failed to catch), Darlene Carlson (DAR), Judy Johnson (Festival of Flags), Bob Garrison and Ande Mitchelle of chapter 1109 (Sedro-Wooley) as well as state council head Francisco Ivarra attended. You can still purchase a brick for the Vietnam Memorial from Gene G. or Dave L.
The rescheduled Bottle Auction occurs April 13th at VFW 1585. Dinner by the auxiliary at 18:00, auction at 19:00. (Learn your 24-hour clocks). Jim and Marjorie Rickenbacker donated $2,400.00 to the chapter in February. A grateful and gracious letter of thanks will be sent. Lonnie R reminded all that the Vietnam Veteran’s Day is 29 March. The Lynden Museum will honor veterans and families from 10:00 to 16:00. A Light lunch will be served around 13:00 (no charge). Address is 217 Front Street Lynden. For more information contact Lonnie R at 360 220 5676. Mac McMaster announced the Veteran’s Day Parade 25 May, beginning at noon in Bellingham. The chapter has only a couple of months to figure out who will walk…is it you? Ande Mitchelle invited all to a Vietnam Vets Welcome Home picnic on 3 August 11:00 to 15:00 flyers and cards were handed out. Francisco Ivarra talked about several things. One being the work of the national. Secondly, the direction of the national organization; financial and future. The membership is aging and in perhaps 10 – 20 years it may disband (last man standing). The national conference is in Spokane this year, July 15 – 21. The state has several responsibilities as host state: supplying flags, colors, marshals etc. It’s proposed that the five marshals come one per chapter. The colors will be supplied by Fairchild AFB. State council meeting is 20 April in Toppenish. On 25 May at the Museum of Flight in Seattle a reconditioned B-52 will be dedicated to veterans of Vietnam. If any individual, group or chapter is worthy of recognition, nominate them for a Washington State VVA Certificate of Recognition. Tom M. noted that Melvin Brewing on Meridian shares proceeds from sales of their special tap (?) every Sunday. This Sunday 10 March our chapter will be the recipient. John Moles briefly discussed the Festival of Flags this year which coincides with the dedication of the Vietnam War Memorial on May 27th. They try to arrange a fly over or chopper landing or some such. This year the Vietnam Veterans will march behind the pipe band. There will be over 1,900 flags on display, every one of which covered one coffin. If you want to help, set up starts at 8:00 (breakfast by the American Legion). Take down happens on Sunday about 16:00. There is more opportunity to help on the take-down shift. Ken R moved that our chapter combine our picnic with the Festival of Flags this year, to ease the problem of being in two places at once. 2nd by someone,passed. Ken R. moved to fund VFW 1585 $500.00 in lieu of rent. 2nd by Ray R., passed. Lana H. suggested that any person who gets his/her name in the paper pay a fine. No decision. Elected officers sworn in by Francisco Ivarra. VFW 9301 serves breakfast on 16 March 8:00 to 11:00. VFW 1585 will have breakfast on 31 March 8:00 to 10:00. 50/50 raffle won by Ken R. donated back to chapter total $95. Since the first tuesday of January was also the first day of the New Year, and everyone watches football, there was no meeting. In lieu of the meeting minutes here are a couple of “thank yous” we received recently. “Thank you to the members of Chapter #165 for their generous gift to help with expenses fro care as I battle cancer. It is both heartwarming and encouraging to experience the bond of Vietnam Veterans helping one another. Your gift has allowed us to have Visiting Angels come to the house and assist me with personal needs. “Sending you and all of the VVA 165 Members wishes for a happy and healthy New Year. 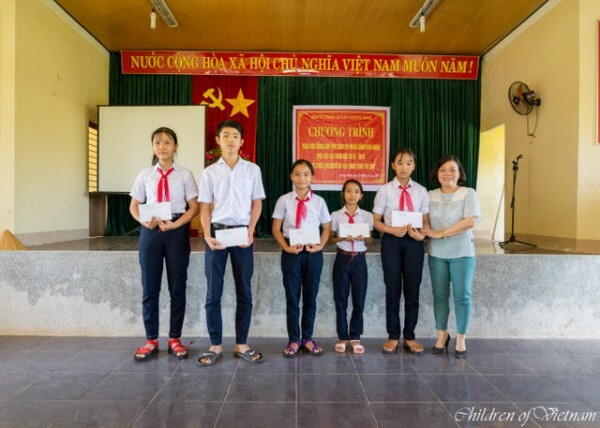 During this time of new beginnings and looking to the future, I want to thank you for your on-going support of children in Vietnam whose families have limited resources to support their children’s education. Your gifts do make a difference to lighten the financial burden and encourage pursuit of good grades. Education creates most certainly multiple paths out of poverty for these children. Attached please find a group photo of VVA 165 sponsored children and a group photo of all of the children. These photos were taken when I visited the children this past fall. I return to Danang in March and I am hoping my schedule will allow another visit. It is always great fun to see how each child grows.” Editor’s note only “our ” kids photo is shown.